Description The men and women of the Continental Army were ordinary men and women like many of us, but these everyday men and women were thrust into extraordinary circumstances. Valley Forge National Historical Park commemorates more than the collective sacrifices and dedication of the Revolutionary War generation, it pays homage to the ability of everyday Americans to pull together and overcome adversity during extraordinary times. Of all the places associated with the American War for Independence, perhaps none has come to symbolize perseverance and sacrifice more than Valley Forge. The hardships of the encampment claimed the lives of one in ten, nearly all from disease. Despite the privations suffered by the army at Valley Forge, Washington and his generals built a unified professional military organization that ultimately enabled the Continental Army to triumph over the British. 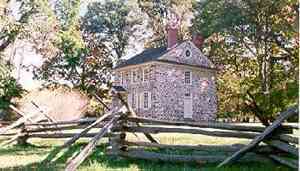 Add Valley Forge National Historical Park to your free online travel itinerary.